Unfortunately there are several diseases that are common Rottweiler health problems, or Rotties at least seem to be more susceptible to than other breeds. I’ve listed them below, in no particular order. You’ll also find links to other sites, where you can get more detailed information about the diseases themselves. Please keep in mind that I am by no means a veterinarian, or expert of any kind. 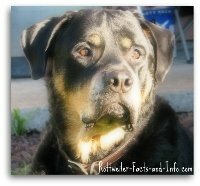 I’ve put together this information about health problems common to Rottweiler's based on research and personal experience into one place for you, so that you don’t have to go searching all over the web to find the information that you need. If you suspect your Rottie may have any of the diseases or Rottweiler health problems listed below, please make sure you consult your vet right away! For reasons unknown, one of the very common form of Rottweiler health problems, is that they are very susceptible to Parvovirus, and seem to die more frequently from it than other breeds that contract it. Vets often recommend that Rotties in particular, should not be taken out in public until they’ve had a 3rd dose of the Parvo vaccine at 18 weeks. This can obviously make it tough to socialize your new puppy, which is essential to proper training. You can find a couple of good suggestions on my Rottweiler training page. This type of mange usually shows up when the immune system is weak, so it’s very important to always make sure your Rottweiler has good nutrition, and even supplements that will help keep their immune system in top working order. 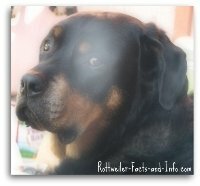 While this isn't necessary a common Rottweiler health problem, and they are not necessarily more susceptible to this than any other breed, I included it here because I had to deal with it when I rescued my male Rottie. He had been neglected and abandoned, so he was very under weight and had obviously been under quite a bit of stress. His chin broke out like he had acne, and he lost all of his hair around his eyes, and on his lips. The poor boy looked pretty pathetic. His case was pretty mild, and we cured it with a couple different medicines from the vet. We also were feeding him a high nutrition diet, and keeping him in a calm, loving and safe environment, which really helped the stress. If you think your dog may have a weekend immune system for whatever reason, and you start to notice any patches of hair loss, a trip to the vet is a must do. Osteosarcoma is a very malignant (meaning aggressive and uncontrolled growth) cancer, and is seen the most often in large breed dogs, which is the category the Rottie falls into. It’s believed that large breed dogs are more at risk for these kind of tumors, because they grow so rapidly. This type of cancer is clearly one of the most devastating of Rottweiler health problems. Tumors are most commonly found in the long bones of the legs. They are destructive, aggressive and painful, especially where fractures happen because the tumors weaken the bone structure. Unfortunately, the outcome is pretty bleak for dogs diagnosed with this type of cancer. Treatment is usually to amputate the effected limb, but because the tumors are so aggressive, they usually spread rapidly to other cells in the body before amputation is even considered, and secondary tumors develop in the rest of the body as well. As you might have gathered, this is a very serious Rottweiler health problem, and I have heard too many sad stories. I tend to be a little paranoid, so I feed my dog supplements and have him checked every six months. Evidence suggests that Entropion is an inherited defect of the eyelids. It is when the eyelid in-turns, so that the eyelashes actually touch the eye and rub it. Obviously this causes extreme irritation and inflammation. A relatively simple surgery can fix the problem. While Entropion isn’t a super common Rottweiler Health problem, it’s something to be aware of, especially if you’re considering purchasing a puppy. It’s in your best interest to find a reputable Rottweiler breeder,, as they will have tested both parents, and be able to provide you proof that this genetic disorder is not present in their breeding line. The retina is the lining of cells inside the eye that are sensitive to light, and allow us to see. Dysplasia means that areas of the retina are detached, and that interferes with the way the eye works, and essentially causes blindness. This is considered an inherited disease, but an autosomal recessive gene is suspected, which means that a dog can appear normal, but be a carrier of the gene. This type usually produces blind puppies at birth. 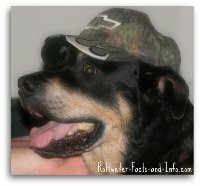 Rottweilers more typically suffer from the multifocal form, which means it might not show itself until later in life. This is obviously a major concern for Rottweiler breeders, and one more reason to make certain you find a reputable breeder if you’re considering purchasing a puppy. A dogs knee’s, which are on their hind legs, are actually called the stifle joint, and they are held together by a lot of ligaments and muscles. The cruciate ligaments are in the center of the joint and cross over each other, keeping the two sides together, and stabilizing the joint during movement. Some speculate that this Rottweiler health problem may be hereditary, but there’s no proof. However, there’s a much higher chance of it happening to a dog that’s out of shape, and especially overweight. Rottweiler’s are serious gluttons, and look at you with those big brown eyes that say “feed me, I’m starving, aren’t I cute?”, but you have to stand your ground and make sure that you keep your Rottie trim and in good shape. When it comes to health, dogs and people are alike, the better we eat and exercise, the healthier we are and the longer we live. Hip Dysplasia is actually not the most significant of Rottweiler health problems despite public belief, but it is an inherited disease and mostly effects large breed dogs. A normal hip joint is a ball and socket, much like ours. The joint is supposed to be a snug fit, and the rotation of the ball within the socket gives it a wide range of movement. A hip with dysplasia has a ball that no longer fits snugly in the socket, and so the joint is loose. When it’s loose and can move around too much, the ball wears on the edge of the socket and creates inflammation and thickens the tissues around it. Over time, bone builds up in the socket, trying to make it a tighter fit, and that in turn changes the shape of the ball, and joint gets completely deformed. All that deformation and inflammation leads to arthritis in varying degrees. Hip dysplasia is so painful for dogs, and so sad. I’m definitely no expert on the subject, so if you are trying to deal with this Rottweiler health problem, I’d like to point you to a place that can provide more information than me. The best thing you can do if you looking to purchase a Rottweiler puppy, is to make sure that the breeder you’ve selected has done everything humanly possible to ensure there’s no evidence of the disease in their breeding line. I’ve done a lot of research on specific Rottweiler health problems and general Rottweiler health issues over the years, and have never found anything documented about their toenails. However, I speak from experience as I have had toenail issues with both of my Rotties. I think Savannah was about 5 years old, when she somehow got an infection in the inside toenail of her right front leg. I didn’t realize for quite some time that it was infected, it just started to look funny and got really thick and odd. She never showed any signs of pain, until one weekend she seemed to get really sick, really fast. She wouldn’t eat, and barely wanted to move and had begun limping on that paw. By the way, when a Rottweiler refuses to eat, you can almost bet money there’s something wrong with them – don’t wait! It was a weekend and my regular vet was closed, so I had to take her to a strange emergency vet. He cauterized her toenail, gave me some basic antibiotics, and she continued to get sicker. I ended up calling my horse vet to come see her, and he gave me an extremely aggressive antibiotic which helped tremendously. As soon as she was mostly over the infection, my regular vet determined that the infection had spread from her nail into her bone (the toenail is connected directly to the bones in dog’s toes) and could very easily spread up her leg. So, we had to decide whether or not to risk her leg and possibly her life. We opted to lose the toe instead of worrying that she might lose her entire leg. Turned out to be a great decision, as she didn’t even know her toe was gone, it didn’t slow her down one bit! I have never been very good at trimming my Rottie’s toenails, and once summer my male Rottie Chevy tore the nail on the outer most toe on his right rear leg. I noticed that it had split down the middle and was turned outward. I watched it for a while, not really knowing what to do about it. Finally it completely broke off, so that there was just a little nub where the nail had been. It didn’t seem to bother him any until one day he started limping on that leg really bad, and licking the toe incessantly, so I took him to the vet. The Dr. determined that he had an infection (which I was all too familiar with). He also examined the toenail and told me that the nail bed was too damaged, and the toenail would probably never grow properly. As it would be very susceptible to getting more infections, he suggested that we have the toe removed like we did with Savannah, although it wasn’t emergent. Since he finished his antibiotic and got rid of the infection it hasn’t really bothered him (almost a year now), so I have put off having any kind of surgery. While I know that he could get a long without his toe just fine, I’m not sure I want to put him through surgery if it isn’t absolutely necessary, so I have just been monitoring it closely.